The foxglove, with its elegant tall stems, luxuriant foliage and proliferation of purple-pink flowers is one of our most beautiful indigenous plants. A prominent flower of Irish hedgerows, ditches and woodland, it is found throughout the country, and in the summer, when in full flower, it’s almost impossible to miss. While the plant’s common name – foxglove – conjures up endearing images of foxes dancing through our countryside adorned with pretty flowers, it’s unlikely that the name has much to do with either foxes or gloves. Much more likely is the theory that the name is derived from a series of corruptions in both spelling and pronunciation of old English words. Glove may have been derived, for example, from the Anglo-Saxon gliew – a musical instrument consisting of many small bells. Another suggestion is that fox is a corruption of folk’s – a reference to the “little folk” or fairies that the plant is associated with. This theory is supported by the fact that in parts of the British Isles – including here in Ireland – the flowers are sometimes referred to as fairy bells. The foxglove is a biennial plant. In its first year of life it produces a rosette of large, textured green leaves covered with a downy silvery hair, but doesn’t flower. The following year the plant throws up one or more flowering stems that typically grow to between 1 and 1½ metres (3-5 foot) in height. During the summer flowering season each stem sports from 20 to 80 individual hanging flowers arranged in clusters at the top of the stem on one side only. The flowers themselves are 4 to 6½ cm (1½ to 2½ inches) long, flattened on the upper side and bulbous on the underside. Their colour is also darker on the upper side and they are paler underneath. The inside of the lower lip is covered with long hairs and is marked with numerous dark crimson spots, each surrounded by a white border. Foxgloves are particularly attractive to native insects and rely on the honey bee and the bumblebee in particular for pollination. The projecting lower lip of the flowers form perfect little landing platforms for these busy insects as they buzz in to sample the plant’s nectar. Every part of the foxglove is poisonous: a characteristic that earned it the colloquial name of Dead Man’s Thimbles. As with many of our more toxic plants the foxglove was widely used by herbalists in years gone by. It was advocated as a treatment for a wide variety of ailments – including as a poultice to reduce swelling, an ointment in the treatment of open sores and taken boiled in wine as an expectorant. Indeed, the plant was often prescribed in a manner that would be considered quite dangerous if employed today. The foxglove’s medicinal properties came to the attention of modern medical practitioners when the English physician and botanist William Withering published his paper “An Account of the foxglove and some of its medical uses” in 1785. 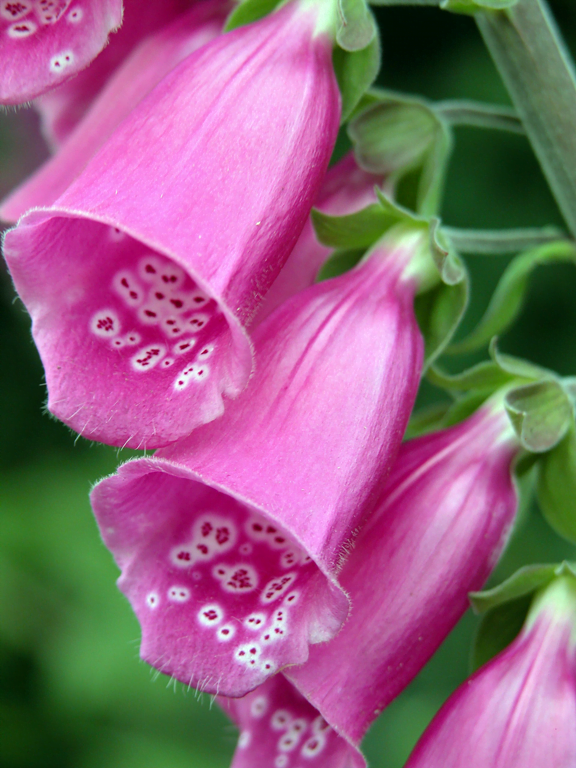 In it he summarised the result of extensive clinical trials with extracts from the foxglove, and described the symptoms of digitalis toxicity in detail. Used as a drug digitalis – the toxin derived from the foxglove – increases the speed, force and pace of cardiac contractions, and today it is widely employed in the treatment of various heart conditions. As well as being a very common wild flower, the foxglove’s attractive flowers make it a popular plant with gardeners. Foxgloves are easy to grow, and can add dramatic form and colour to the garden. Many cultivated and introduced forms are available today, but for great visual impact and maximum wildlife benefit you can’t beat our native wild variety, Digitalis purpurea. They are poisonous if ingested, but as long as you don’t eat them they’re fine. Of course it’s always a good idea to make sure kids wash their hands after handling any plants / animals and especially before eating, and you probably shouldn’t encourage them to play with the foxgloves. We have loads of foxgloves in our garden — this year seems to be a particularly good year for them — and have never had an issue. Just don’t eat them :-).